How many of you have stared at a night sky covered with thousands of sparkling lights? Most of these are stars, which are really huge balls of burning gas. We can see the stars because they generate their own light. Stars produce extreme light and heat through nuclear reactions that take place at tens of millions of degrees Kelvin. It is the same reaction as a hydrogen bomb, except that the reaction in the stars goes on for billions of years without stopping! You have probably noticed that stars are not all the same. Some are very bright, others are very faint. They glow in different shades of color: white, yellowish, blue, orange and even red. You probably already guessed that one of the reasons that stars appear different is distance. Surprisingly, the closest star to the Sun, Proxima, in the constellation Centaurus, is not the brightest star in the sky. Learn more about the color and magnitude of stars, main sequence stars, dead stars and stellar systems. The visible size of a star depends on its distance from Earth. Astronomers adjust for this to see how bright a star will be when it is a 32.6 ly away. They call this absolute magnitude. It shows how luminous a star really is and how much energy it emits in the space compared to different stars. Stars mature, or become main sequence stars, when the process of nuclear fusion begins in their core. The fate of a single star depends on its mass. Surprisingly, smaller stars have long and relatively stable lives, while massive stars live short and intense lives. Since small stars use their fusion of hydrogen economically, they shine evenly for billions of years. Middle-sized stars, like our Sun, will become red giants when they exhaust their hydrogen. The central part of the star collapses and heats up until nuclear fusion of helium starts outside the core. At the same time, the outer layer of the star becomes bloated. Since the star's energy is emitted through a larger area, the surface itself becomes cooler and shines red. If the star is large enough its central parts collapse several times. Every time the central part compresses, the outer layers expand more. Such stars become super giants. While small stars have a long life and calm a death, massive stars live intensely and die dramatically. When small stars run out of hydrogen, they simply collapse, cool off and fade away. The middle size stars, like our Sun have a more spectacular death. The central part of such star shrinks down fast and forms a white dwarf star. This ejects the outer layers, which form a spectacular planetary nebula or gaseous dust clouds. The most impressive is the death of stars 50 times larger than our Sun, for when they run out of fuel their core collapses so fast a gigantic explosion know as supernova occurs. When the material of explosion becomes transparent, it reveals the core remnant, which depending on its mass could became an white dwarf (less 1.4 Sun masses), neutron star (between 1.4 and 3 Sun masses) or black hole (more then 3 Sun masses). The white dwarfs consist of atoms with pressure high enough to stop further gravitational collapse. While the average white dwarf is about the size of the Earth, typical neutron stars have diameter about 10 km. They are so dense, that under gravitational squeezing the electrons "fall" on the protons and form neutrons and neutrinos. The pressure is high enough to stop further collapse of the star. However, if the star is bigger than 3 solar masses nothing can stop the collapse and formation of a black hole. Since stars are born in groups, they tend to stay in groups. Single stars, like our Sun, are exceptions to the general rule. As we know, stars form together in interstellar dust and gas clouds, so when stellar wind expels the remaining gas, we can observe a star cluster, like the Pleiades in the constellation Taurus. Open star clusters are groups of tens to hundreds of stars that reside same region in the Galaxy. Over time some of the stars are pulled out and become single stars, like our Sun. Others stay together as binary, triple and multiple star systems. While open star clusters consist of several hundreds of stars and have irregular shapes, globular clusters are stellar systems that contain tens thousands or even billion of stars. All known globular clusters in our Galaxy are far away from our Sun. They contain very old stars aged about 13.2 billion years, almost the same age of the Universe. Black holes are exotic objects that have characteristics beyond our imagination. Predicted by Einstein's gravitational theory, by definition they are completely collapsed objects with a gravity that is so great that they swallow everything around them, even light! There is no way to directly see black holes. However, we can detect their effects. If a black hole is a part of a binary star system, it can engulf the matter of the other star. The gas from the companion star spirals faster and faster, forming a disk around the black hole. Because of the extremely high speed and friction between particles, the disk heats and lights up. It also emits strong X-rays. Since there is a strong magnetic field around the black hole, some of the particles move up and down from the disk, forming powerful jets that look like cosmic projectors. Astronomers can also calculate the mass of the invisible object by the way the companion star moves. If the mass happens to be more than three solar masses, they have discovered a black hole. Have you ever seen how white light forms a rainbow after it passes through a prism? Scientists know that the different colors are electromagnetic waves with different lengths and energies. Radio, heat, microwave, Ultraviolet and X-rays are all electromagnetic energy. Each has a corresponding wavelength. Stars emit a unique pattern of wavelengths called a spectrum because of their complex composition. The spectrum is like a signature that allows us to determine chemical composition, distance, temperature, and even velocity of space objects. Pulsars are neutron stars that emit very strong radio signals periodically. The regular nature of the signals made scientists think that they might be signals from extraterrestrial civilizations, but later it became clear that neutron stars emit these signals. Since they have strong magnetic fields and spin very fast, strong radio, X-ray, or Gamma-rays can be emitted. The study of systems of two stars orbiting around one another, known as binary stars, is very important. Eclipsing binaries, where the smaller companion is dimmed by the brighter star, helps scientists to determine precisely the masses of the two companion stars. A temperature of 0 kelvin is equal to -273.15° C and -459.67° F.
310.95 kelvin is equal to 100° F and 37.8° C.
A red dwarf star located in the constellation Centaurus. At 4.2 light years away it is the nearest star to Earth, other than the Sun. It was discovered in 1915 by the Scottish astronomer, Robert Innes. A constellation found in the southern sky, and home of the Alpha Centauri triple star system. The brightness of a star as seen from a standard distance, defined as 10 parsecs. 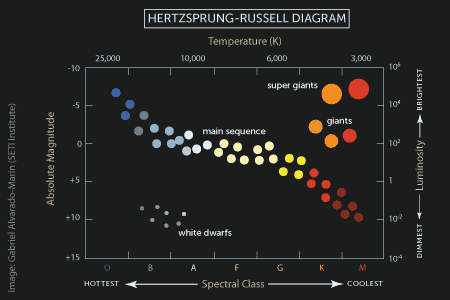 Average and stable mid-phase stars, as plotted along the diagonal top right to bottom left band of the Hertzprung-Russell diagram. Extremely large, massive and bright stars which have shorter life spans when compared to other stars. A small, very dense star oject that cannot collapse into itself any further; one possible result for a low-mass star at the end of its life. Gas ejected from a star that is approaching the end of its life; resembled a planet to early telescopic observers. A small, very dense star oject that cannot collapse into itself any further; on possible result for a low-mass star at the end of its life. A very dense core of material that forms after a star explodes. Electrically neutral, sub-atomic particles which are created in some nuclear reactions, such as can be found in certain stars and supernovae. Because they have no electric charge, they are not affected by electromagetic forces. A star system with three stars orbiting around one another. Also known as trinary stars. Alpha Centauri is an example of a triple star system. A star system containing three or more stars (but less than what is found in an open star cluster) which orbit each other. Most multiple star systems are triple star systems, but there are quadruple, quintuple, sextuple star systems, and more. The star systemNu Scorpii, in the Scorpio constellation, is believed to be a septuple star system, containing seven stars orbiting around one another. Groupings of stars that are less dense than globular clusters, containing no more than a few thousand stars and generally lacking a central core.